The Voleo Nasdaq simulated equity trading competition gave students across the US a chance to develop and sharpen their investment skills. One such student researched his way to the top; Colin Summers was our top trader from the competition, and surprisingly, knew little about investing before beginning. Voleo: Colin, how did you become interested in investing? Colin Summers: I have always had the mindset of an investor. Something about buying stock and watching it grow into larger sums of money has always caught my attention. I would say my interest was peaked when my parents described to me their encounters with financial advisors, planners, etc. The description they gave me of their jobs further pushed me to look into a career in investing. What do you think gave you your edge in the Voleo Nasdaq trading competition? Ironically, the one thing I feel gave me an edge was that I came into the competition knowing very little about investing. In order to counter this, I had to put in hours of research so that I could even have a chance in the competition. if I didn’t have the drive to become the best investor, then I don’t think I would have nearly as successful as I was. Ironically, the one thing I feel gave me an edge was that I came into the competition knowing very little about investing. In order to counter this, I had to put in hours of research so that I could even have a chance in the competition. How would you describe your investment strategy; are there particular industries that you prefer, do you invest for the long haul (retirement), or for the future purchase of an asset, like a home? As far as the competition goes, I was very aggressive and tended to throw large amounts of money into a company I felt would provide a huge return. Outside of the competition, I tend to be a bit more conservative and invest for the long haul. As far as industries, I really like the energy and technology industries because they have potential for faster growth than some of the other industries, which can be a bit more stagnant. What do you think are the most important factors to consider when looking at purchasing a stock? I believe there are many factors that should lead into purchasing a stock, but I will point out a few that I find particularly important to me. First and foremen is the reliability of the company and their ability to be successful both in their stock and in their company as a whole. Second is the consistency of the company to provide significant returns on their stock on a yearly basis. The final, and most important, factor is what competitive advantage the company has overs it competitors. This is especially important for newer companies that don’t have a track record, but could be on their way to becoming a successful business. Is investing part of your everyday routine; checking stocks, reading up on companies, or is it something you set time aside to sit down and focus on? I definitely check up on the stock market, as well as the cryptocurrency market, on a daily basis. When it comes to reading up on companies and other stock concepts, I try to set aside ample time to do in-depth research. How did you find the social aspect of an investment club? The social aspect was quite interesting. Communication was by far the most important key to being a successful club. Sometimes a matter of a couple hours meant the difference between achieving a gain or loss on your investment. To overcome the loss of efficiency and control you get as an independent trader, clubs had to quickly coordinate each decision and send it to market as soon as possible. While there can be some disadvantages to group trading, there are many advantages. 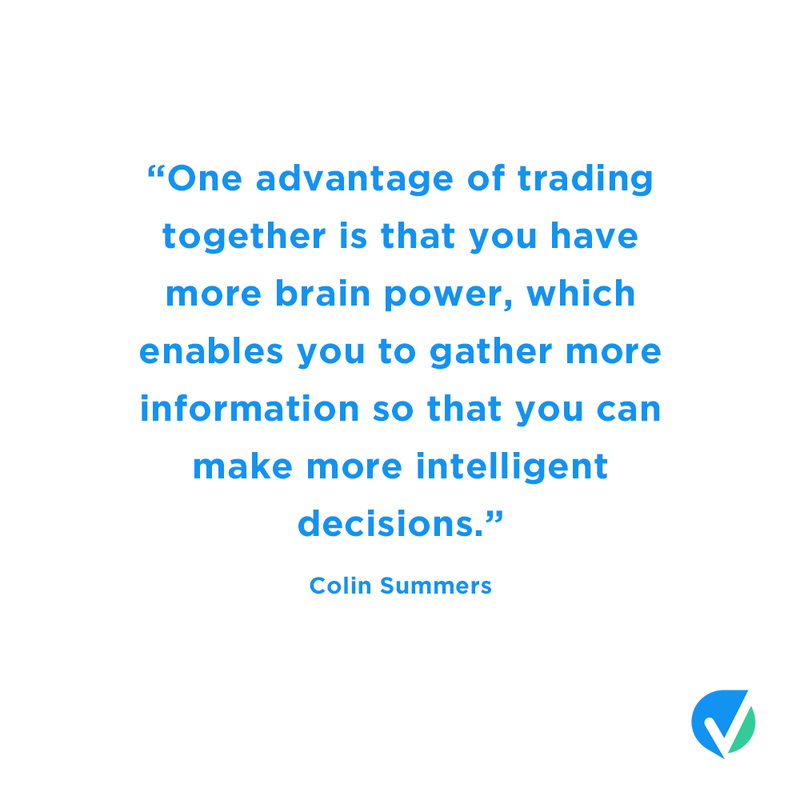 One advantage of trading together is that you have more brain power, which enables you to gather more information so that you can make more intelligent decisions. Overall, I enjoyed the social aspect of group trading and the challenges that came from it. Was there anything that surprised you about the Voleo Nasdaq competition? What surprised me the most was the amount of work it took to research just one company. It look at least a couple hours to see if a company was truly worth investing in. Then you had to decide on how much money you wanted to put in and the risk that came with that decision. It was a great deal of work, but in the end it was worth it. If you could give one investing tip, what would it be? The best advice I could give is to have patience. it may take a long time before you start to see even the slightest growth in your stock. My team was doing well in the first month of the competition, but out of nowhere our stock fell off the table. We had started to give up, but then slowly our stock began to rebound and, with a couple of good investments, we re back in the top fifteen clubs. I definitely learned from this competition that you must be patient, because if you are an investor who puts in the work and is passionate, then growth in your stock will eventually come. How did you come to choose a major in finance? Ever since I was a child, I have always had an interest in business. I never really knew what I wanted to do until a high school assignment where my teacher asked the class to choose a major that most interested us. I did some research and found that the characteristics of a person in finance was comparable to my interests. From that point on, I decided that finance was the route I was going to pursue in college. What are your sources for investing and stock market info? I don’t really have one source that I solely rely on. I typically utilize multiple sources and websites to gather my research. However, you can never go wrong with Yahoo Finance or Google Finance. They provide all of the financial info you need to know about the company and allow you to compare them to other companies. An ideal Saturday would include a morning hike in the mountains, then catching a Giants came against the Padres in the evening time. An ideal Sunday would be working out in the morning, then sitting back and watching some football. My favorite book series has to be “A Series of Unfortunate Events,” by Lemony Snicket. They were always action packed and told a story of three children who were born into wealth, but dealt with having poor luck. My favorite coffee would have to be a Starbucks americano with some cream and a couple splendas. Best / most-used apps on your phone? I would say my top five would be Twitter, Instagram, MLB At Bat, NFL Mobile, and Clash of the Clans. What is the best place you’ve visited? Maui for sure. It has the most beautiful scenery, most delicious food, and you can snorkel and see turtles anyway you want. I’m hopefully going to travel abroad in Fall 2018 to Germany, so that is the place I have next on my travel list. Thanks very much to Colin for taking the time to answer our questions, and congratulations on being the Voleo Nasdaq top trader!